Each year on April 8th, National Zoo Lovers Day is celebrated in recognition of the approximately 175 million people that love and visit zoos. 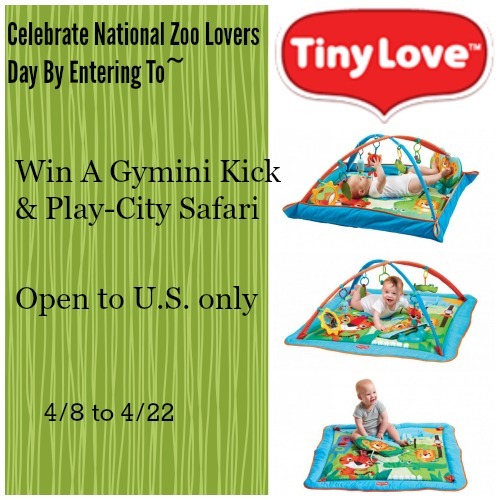 If you can’t make it to the zoo, bring it to you not only on April 8th but every day, with the NEW Tiny Love Gymini Kick & Play – City Safari. Additionally, don’t forget to share with your readers that from now until April 14 Right Start and Kids Land are offering 20% off ALL Tiny Love products! Winner will be chosen at random and have 48 hours to respond to email or another will be chosen. Disclosure- Tammie of Tammie’s Reviews, Giveaways and More did receive a complimentary product to facilitate her review. We are not associated with any of the companies named above. No purchase is necessary to enter. Void where prohibited by law. The odds of winning are based on the number of entries received Open to the US 18+ only. Confirmed Winner(s) (by Random.org) will be contacted by email. Winner(s) have 24 hours to respond before a new winner is chosen. No purchase necessary. Void where prohibited by law. The sponsor(s) will be responsible for product shipment to winner(s) of this giveaway. My blog is not responsible for product shipment/delivery nor did I receive compensation. Only 1 prize per household. This event is in no way administered, sponsored, or endorsed by, or associated with, Facebook and/or Twitter, Google, Pinterest. This disclosure is done in accordance with the Federal Trade Commission 10 CFR, Part 255 Guides Concerning the Use of Endorsements. Entrants must only enter with either one email address, IP address and/or Facebook account, anyone found violating these rules will be disqualified. It is at the sole discretion of the admin of the giveaway if the winner has met the rules or not.Contact Tammie at info@tpankuch.com and see how I can promote/feature your product for you. Previous post: Do you love Pampers Easy Ups? Check this out!! I like to go on picnics and BBQ cookouts. I also love bon fires and family get togethers. I enjoy in the summer, sitting on the patio with iced tea. I plan on spending as much time as I can with my kids this summer. We are traveling home to California to visit all of my family. I moved to Ohio 2 years ago so it will be nice to be back home for a bit. It is wonderful to take walks in parks in the summer. I hope I have time to do lots of crafts for myself! It would be really nice and to have my supplies organized! I like to take the time and relax in at the summer and read a few books. We like to walk around down town, where there are a lot of fun stores in the summer. We go camping and fishing as often as we can during the summer. We are hoping to go to the zoo and park with my daughters more often!! We also plan on doing some 5Ks as a family! We enjoy having BBQ parties in the summer. I am just making over the yard not traveling did that last summer. We enjoy visiting relatives over the summer or have a family reunion. I’m due with a little girl in June, so my Summer plans will involve taking care of a newborn. We have a wonderful zoo in our area that we visit frequently. We even buy a season pass each year! We really like to go to some nice outdoor concerts in the summer. I have a grandnugget on the way, so I want to brush up on my photography skills. I’m looking forward to the birth of my first grandchild in August. One of my plans this summer will be to take my grandchildren camping , I think they will enjoy it. This summer I plan on attending local festivals, craft shows and outdoor concerts. Our community will be celebrating the 150th anniversary of the town. Our summer plans are just to relax and enjoy the season! We have more leisure time in the summer. I’m really hoping we’ll take a road trip to my old college town….haven’t been back in a while and I’d like to see how it’s changed.